This passage set forth the materialist conception of history or historical materialism. 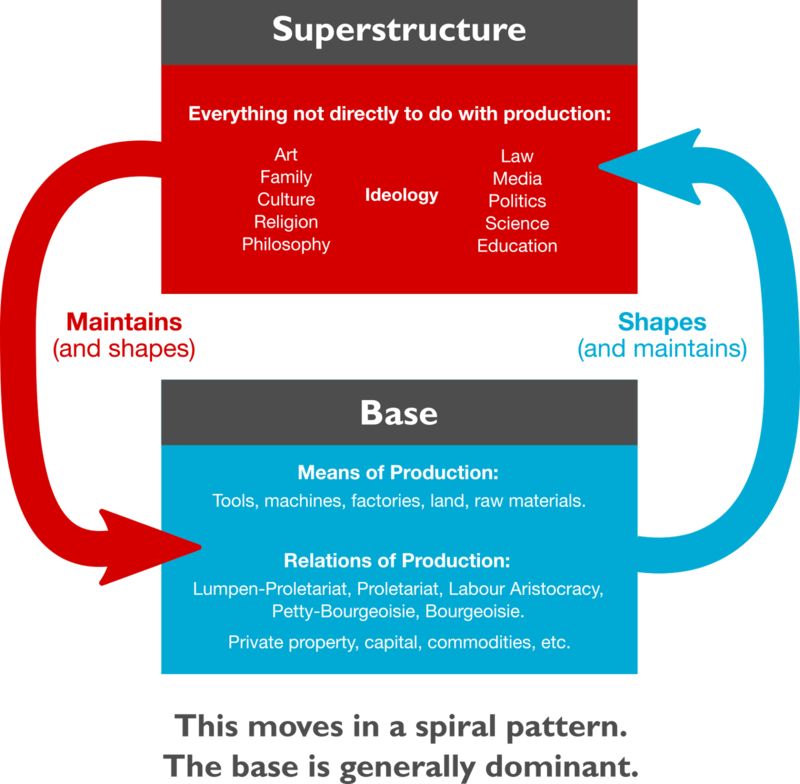 Relations of production: the way people organise themselves to satisfy their basic necessities of survival, people have to enter into social relations. In Marxist theory, human society consists of two parts: the base and superstructure. Relationship between the base and superstructure is reciprocal. ...refers to the physical means and techniques of production to which labourers add value and transform raw materials into capital. This includes the combination of the means of labour (tools, machinery, land, etc.) with human labour (techniques, knowledge). Social relations of production occurs between people. Technical relations of production occurs between people and object. E.g. the relationship between those who own the means of production and those who do not. Social revolution occurs when there is conflict/contradiction within the base. The process of being conscious of your social conditions, relations can change the system, but this change is explained through the ‘contradiction of material life, from the existing conflict between the social productive forces and the relations of production’. Perhaps art can inflect and disrupt conventional social norms, thinking and therefore relations thereby changing the relations of production, creating conflicting within the base. An inquiry into the relations of production, and then a critique. Only when new forms of bases developed can the superstructure of society change. Not enough to be conscious, but the structures, potentialities for change have to exist concurrently as well. Historical materialism is a methodological approach to the study of human societies and their development over time.